Perfect for gift giving and the Holidays! We make our own "Lab approved" Vermont Maple Syrup! and voted number 1 tourist location! Fresh baked cider donuts, pies, and cookies! We make our own and ship direct to you! The Sugar Shack is located in Arlington, Vermont on Historic RT7A (Sugar Shack Lane). We make pure VT Maple Syrup and have an assortment of hand picked products from Vermont made with all natural ingredients that will satisfy everyone. There are four grades of pure VT maple syrup to suit everyone’s taste! Golden with Delicate taste – formerly known as “Fancy”, Amber with Rich taste – formerly known as Medium Amber (most popular for gifts), Dark with Robust taste – formerly known as grade B, and Very Dark with strong taste – formerly Grade C.
The Norman Rockwell Exhibition is an exhibit that focuses on Rockwell’s work from 1939 – 1953, the years he actually lived in Arlington. His use of over 200 local people as models for his work is a centerpiece of the attraction. An Arlington resident for years, Norman Rockwell was noted for his paintings of everyday people and situations. His art tells stories of middle class America and possesses a humor that has delighted generations of Americans. He was a meticulous craftsman, his illustrations showing careful observation and great technical skill. Four of his most famous works, “The Four Freedoms”, were painted in Arlington during WWII using his neighbors as his models. They appeared in the Saturday Evening Post and were also used to raise over in war bonds. Arlington is a small community located in the southwestern part of Vermont, no more than 3-4 hours from both New York and Boston. The area is referred to as the Shires of Vermont with Arlington affectionately called the “heart of the shires” since it is located midway between the main towns of Bennington and Manchester. Arlington is proud of the fact that Rockwell made his home here for 14 years from 1939-1953, using many local citizens as models. Although most of the models are getting on in years and some have moved away, it is not unusual to have them come to talk to our bus tours or just stop by to say hello and reminisce. Although small, Arlington boasts a number of historical and cultural attractions with antique centers, art galleries, bed and breakfasts, inns and small gift shops dotting the countryside. 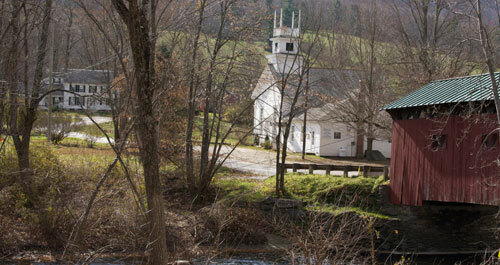 The main route through town is Historic 7A, which has recently been designated as a historic byway. There are also two covered bridges in the immediate area with several others around the county. Click here to learn more about accommodations and activities in the Arlington region. 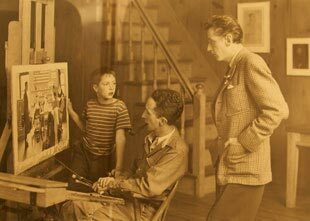 Norman Rockwell spent many of his most productive years as an artist in Arlington. Many of the locals became his models and were featured on some of his most famous illustrations and covers. Check our Facebook page for times you can meet the models yourself, or take a bus tour where you will be greeted by one of his models.